Pulse Technology is a unique, patented technology built into our products designed to prevent and remove sulfation. Sulfation is the main cause of battery problems and failure, on all types of lead acid batteries, including flooded, AGM, VRLA, Gel and flooded cell. Eliminating sulfate buildup from lead-acid battery plates improves battery performance and extends battery life up to 3 times. Sulfation is the creation of lead sulfates. It is a natural and necessary part of a battery's life and occurs whenever the battery is in a state of discharge, i.e. whenever the battery is NOT charging. Over time as the battery discharges, the electrolyte solution inside the battery turns into water and the lead plates become covered with lead sulfate crystals. As a battery ages through use or sits unused for periods of time, these lead sulfate crystals enlarge and eventually build-up to the point where they create a physical barrier across the surface of the battery plates. Before long, this build-up can become so dense that a battery is no longer able to accept or release energy. Battery sulfation is a wasting disease that claims the life of 80 percent of the batteries in use worldwide. Don't let your battery be one of the 80% that die needlessly. Pulse Technology is the cure. Pulse Technology is delivered to the battery through a circuit which is independent of the charging circuit. This patented, high-frequency pulse waveform is of a specific amplitude and frequency that is precisely controlled by microprocessors. It rises rapidly in less than one microsecond to its maximum amplitude and gradually returns to zero. There is no abrupt stop and no battery drain. This waveform occurs 25,000 times a second and has been proven to remove sulfation from the battery plates and return the lead sulfate back to the electrolyte solution. PulseTech's patented waveform is simply the most effective method to remove damaging battery sulfation and enhance battery performance available today! These battery plate photos are from an independent study, conducted by TS products, that compared Pulse Technology charging to conventional charging. The top row of plates, charged with Pulse Technology, remain free from sulfates and ensure battery performance at maximum peak capacity. Note the development of battery-killing sulfates on the conventionally charged lower plates. "This evaluation indicates that many batteries previously condemned could be reclaimed if Pulse Technology were used extensively; assuming there is no internal damage to battery, i.e. : plates, etc." The report goes on to state: "In conclusion, Pulse Technology worked by removing sulfation from the battery plates as the manufacturer claimed. It is unknown exactly how long a battery will last with Pulse Technology connected, but it is estimated at least eight to ten years of life can be added." By minimizing sulfation buildup and thereby producing less resistance through the charge and discharge cycles throughout the "usable" life of a battery, the battery's life can be enhanced considerably. 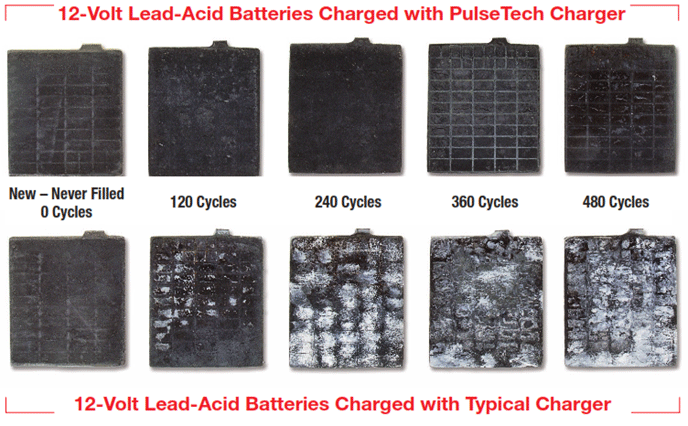 PulseTech's patented Pulse Technology has been proven to remove naturally occurring lead sulfates from the battery plates and return them to electrolyte solution. Used consistently, Pulse Technology will prevent the larger crystals from forming allowing more room in the battery to store energy which in turn allows the battery to accept, store and release more energy. Make no mistake – patented conditioning process is NOT pulse charging or a burst of high voltage provided within the regime. Instead, the low-voltage, high-frequency conditioning pulse is introduced into the battery via a separate circuit independent of the charging circuit. This precisely-controlled waveform has proven to be the best at removing sulfation from the battery plates and returning lead sulfate back to the electrolyte solution. Although the lead-acid battery is not excessively expensive, its cost goes up dramatically when you include the cost of downtime, disposal and labor hours. These costs will be reduced or even eliminated by simply extending battery life and increasing battery efficiency. In addition, our Battery Management Program, which incorporates our patented Pulse Technology reduces battery consumption by an average of 70%. After the tire, the battery is the most expensive and difficult product to dispose of safely. Yet, it is estimated that over 80% of the batteries being discarded every year are only suffering from lead plates that are clogged with sulfate crystals. Imagine the contamination that prematurely dumping battery lead and sulfuric acid across the nation can cause. Then realize what difference the implementation of Pulse Technology can make. By extending battery life and improving battery efficiency, the number of batteries being prematurely discarded can be reduced considerably and the potential environmental damage can be avoided reducing both your carbon footprint and increasing adherence to corporate sustainability policies.